The M2SYS Biometric Identification System (BIS) is a scalable and customizable automated fingerprint identification system (AFIS) that allows you to perform a wide variety of tasks for processing, editing, searching, retrieving and storing biometric templates and subject records. In addition to our standard AFIS fingerprint system, we offer a multi-modal automated biometric identification system (ABIS) which can combine fingerprint identification with an iris or facial recognition modality. Characterized by the utility to tailor deployment models based on unique needs and market conditions, our military grade system is specially designed to meet government agency requirements and delivers fast, secure and reliable results. The M2SYS AFIS ensures quick and efficient service while providing information safety through the use of fault tolerant architecture, disk mirroring, automated database backups, and disaster recovery options. Our M2SYS AFIS fingerprint matching software is available as a ready-to-use biometric solution with server hardware or as biometric software that will run on a regular PC. 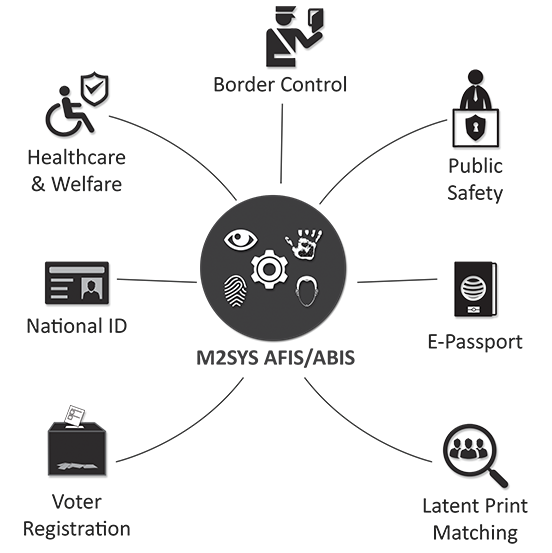 We provide ISO and ANSI fingerprint template standards support and full NIST and FBI IAFIS search compatibility. Our AFIS fingerprint software is capable of supporting tenprint databases ranging from tens of thousands of prints at a local level to millions of prints at a national level. Integrating a deduplication engine with our AFIS fingerprint enrollment software will pre-process enrollment data prior to storage, removing duplicate entries to ensure a unique identity for enrollees. Plus, our hyper-threaded one-to-many M2SYS SuperServer™ ABIS matching architecture can be scaled by clustering servers to search 200 million irises or 100 million fingerprints per second and also supports facial recognition. Please contact us for more information or a live demo of our automated fingerprint identification system by filling out the form on the right side of this page.